Bizarrely, I think what makes panzanella so compellingly delicious is the soggy bread. Sounds appealing right? Bear with me. 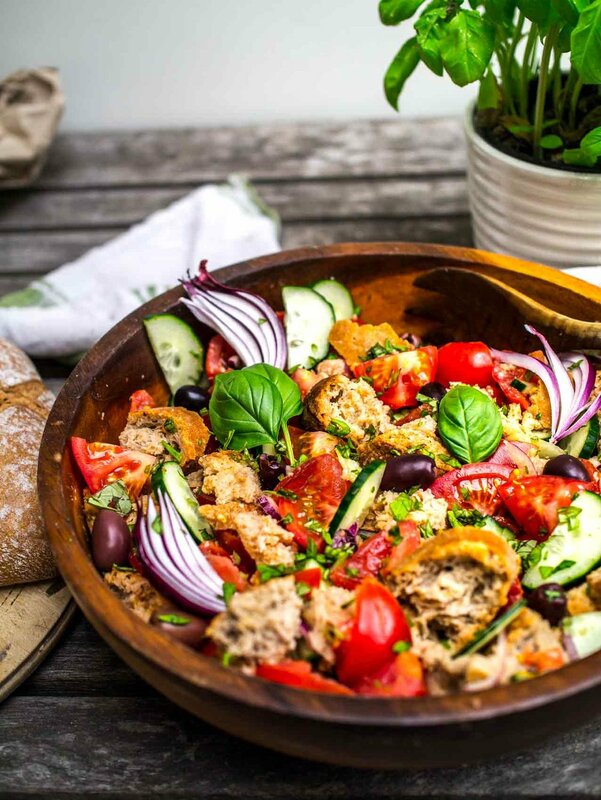 The defining characteristic of panzanella is the reinvigorated stale bread, soaked in a sharp tomato juice dressing. The bread becomes creamy and, if timed correctly, retains a slight bite in the middle where the dressing hasn't quite reached. And what a great use for stale, leftover bread! I mean, what else are you going to do with it? I hear you thinking 'make croutons!' or 'bread-and-butter pudding? ', but panzanella can't be beaten in my book. Some recipes use anchovies in the dressing for a salty, umami flavour. Whenever a recipe calls for anchovies I immediately reach for a jar of capers. They provide a similar salty-sour punch and don't disappoint here. Another traditional component is Pane Toscano (Tuscan bread), which doesn't have any salt. Opinion varies, but it’s probably either because the 15th century pope imposed taxes on salt, or the bread would be served with already salty food like cheeses and cured meats. Regardless, I actually made a couple of Pane Toscano loaves when I tested my bruschette recipe and found it pretty unpleasant. It was gummy, flavourless and heavy, which is perhaps why panzanella has evolved to use rustic, country style bread like sourdough or pain de campagne. I've used very stale ciabatta in the past, which worked well, but I'd recommend you stay away from any pre-sliced supermarket bread that lacks structure or chewiness, and also any bread that's fresh, both of which will quickly turn to mush. If you don't already have stale bread and are using fresh bread, tear it into chunks and spread out on a tray. Leave to stale for a minimum of 3 hours. Put the tomatoes in a colander set over a bowl. Sprinkle the tomatoes evenly with the teaspoon of salt and leave to drain for 30 minutes. Meanwhile, put the cucumber, red onion, olives and bread in a large salad bowl. If are not keen on raw onion, soak the red onion in cold water while you wait for the tomatoes to drain. Gently press the tomatoes with your hands to squeeze out more juice, but not so hard as to squish them. Add the tomato flesh to the salad bowl. Add the capers, garlic, sugar and red wine vinegar to the tomato juices. Blend using an immersion (stick) blender or, if you don't have one, a normal blender. Just use a whisk if you don't have either. Slowly drizzle 4 tbsp of the olive oil, while blending, into the dressing. Pour enough dressing onto the salad to soak all the bread pieces (this might be all of it, depending on how much juice you get from your tomatoes). Toss gently so the dressing coats everything. Leave for 15 minutes for the bread to soak up the dressing. Don't skip this step! Drizzle over the remaining 1 tbsp olive oil, season with salt and pepper, sprinkle the basil on top and serve.